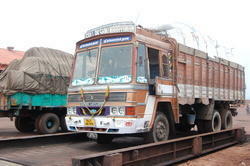 We are a leading Manufacturer of load scaling pitless weighbridge from Indore, India. Accredited in the industry as a manufacturer and supplier, we are busy in presenting a wide range of Pitless Weighbridge for Load Scaling. The offered pitless weighbridge is accurately manufactured by utilizing best material of market according to the market norms. We provide this Pitless Weighbridge in special stipulation which satisfy our patrons & can be purchased at the reasonable rates. Looking for Load Scaling Pitless Weighbridge ?